"A simple soup but built with exquisite taste! Serve with chopped green onions or fresh parsley, optional." 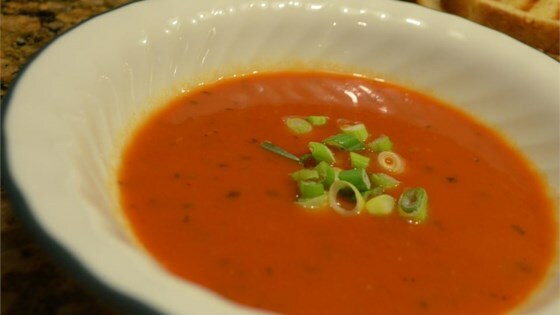 Combine the tomato soup and the water in a large sauce pot; simmer, stirring occasionally, for 5 minutes. Add the tomato juice, chives, garlic, cayenne, rosemary, thyme, oregano, basil, and paprika to the pot. Simmer soup for 25 minutes, stirring occasionally. Stir in the diced tomatoes and red peppers. Simmer until peppers are soft, about 10 minutes. Roast the red peppers before adding to the soup to add a great smoky flavor. Oh yeah... this was simple and delicious.